Initial Thoughts: I love the variety of products in this bag: makeup, haircare and facial cleansing products. I have used Proactiv in the past and loved it, so I was excited to try some samples from their new Proactiv+ line. The Elizabeth Mott Eyeliner excited me when I first saw it. It is almost the exact color of my favorite eyeliner (which is Urban Decay). Unfortunately, the eyeliner is not very pigmented. It doesn't show up well on my skin and rubs off easily. I'm on the fence about the Malin+Goetz lip balm. It is a weird gel and I can't decide if I like it or not. I do hate that I have to use my finger to spread the lip balm. The hair deep conditioning mask will go to my Mom since she has dry hair. I'm excited to try the sugar scrub. It smells amazing. Overall, I am pleased with this bag. Initial Thoughts: THRILLED!! The butter London product makes this box worth it by itself. I have been considering leaving Sample Society and this box made me happy that I didn't. While the StriVectin-SD is ridiculously priced, I enjoy using the samples of it that I am sent. The Retexturizing scrub is really awesome, but drying. So, I used the Malin+Goetz moisturizer with it. Once again, I am on the fence about the Malin+Goetz product. It made my face feel a little greasy. I love it on my neck though, so I am going to keep using it there. I'm never thrilled to get perfume samples, but the Nicole smells pretty good. 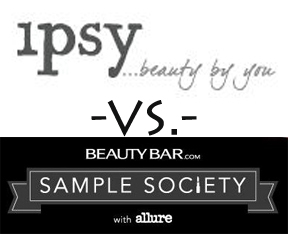 This month's winner: Sample Society finally gets a win! While I really liked the products in both boxes, the full sized butter London gives SS the win. The Sample Society box also had all products that I like. The Ipsy box had a few hit or miss products and a hair conditioning product that I can't use.